Yes, we do live in a wonderful environment here on the Coffs Coast however, there is one aspect that perhaps we could do without - Ticks. Most gardeners have had experience of these little blighters but the following story from ABC Catalyst is really quite alarming. There was one positive from this episode though, and that was the most effective method of tick removal. Please click here to view the Catalyst segment. A nurse discovered a safe and easy way to remove ticks, making it less traumatic for the patient and easier for you. Here's a way to eliminate them on you, your children and your pets. 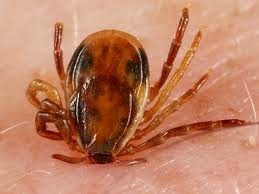 The tick will spontaneously detach and stick to the cotton as you remove it. Notify everyone! This may help so many, especially with those hard to reach areas. Tip: Keep liquid soap & cotton balls in your summer first aid kit. Thanks Robyne for this handy hint for what is a real problem for us here on the Coffs Coast.